Construction technology entered a new era this week when the first-ever, fully functional, full size 3D-printed excavator was unveiled at Conexpo 2017 in Las Vegas. Known as Project AME - Additive Manufactured Excavator - industry partners, university students, Oak Ridge National Laboratory (ORNL) researchers designed and fabricated the world’s first large scale use of steel in a 3D printing application. The excavator is a prototype what is possible in large-scale additive materials (AM) technologies and proved the feasibility of printing with metal alloys. Lonnie Love, group leader of ORNL’s Manufacturing Systems Research Group, did the honors speaking to the crowd about the future of 3D fabricating and the benefits the construction industry will see in the future. Under the direction of Love, research teams of graduate engineering students from Georgia Tech, University of Illinois, and The University of Minnesota adapted the basic design of a compact excavator and engineered plans to build the machine's cab, work arm, boom, bucket, heat exchanger, cooling system, and hydraulic oil reservoir using additive manufacturing processes and technologies. 3D printing an excavator for the first time was a learning experience for both seasoned researchers and the next generation of engineers. “The beauty of a project of this size and scope is that it brings together many intelligent people to work on a number of challenges while accomplishing a common goal,” said Love. The student engineering teams were able to witness their designs taking shape on the 3D-printing equipment at the Department of Energy’s Manufacturing Demonstration Facility at ORNL. 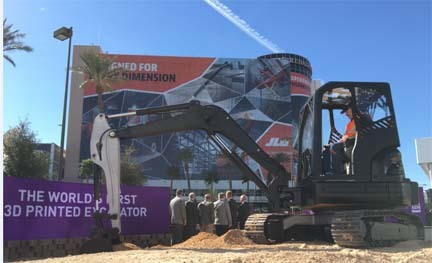 The excavator was developed as a joint collaboration between the Association of Equipment Manufacturers (AEM), National Fluid Power Association (NFPA), Center for Compact and Efficient Fluid Power (CCEFP), Oak Ridge National Laboratory (ORNL) and the National Science Foundation (NSF). The project was funded by DOE’s Office of Energy Efficiency and Renewable Energy – Advanced Manufacturing Office. AMO supports applied research, development and demonstration of new materials and processes for energy efficiency in manufacturing as well as platform technologies for the manufacturing of clean energy products.